COPPERAS COVE TX (March 20, 2019)—S. C. Lee Junior High sixth grader Jalen Grant read Slider, Wedgie and Gizmo, Step Right Up, Refugee, and Sergeant Reckless, all Texas Bluebonnet Award nominees. But, which one would be voted the best book on the list of 20 in the Lone Star State? Each year, twenty books, written for children in grades 3-6, are chosen to be on the Texas Bluebonnet Award Master List. Afterwards, schools and libraries around the state of Texas participate in the program by encouraging the students to read a minimum of five books from the list. Students vote for their favorite title out of the books they have read. From those results, the author receiving the most votes is the winner of the Texas Bluebonnet Award, which is presented to them at the Texas Library Association Annual Conference Luncheon in the spring. According to TLA, this year more than 131,000 students from third grade to sixth grade at 1,464 public and school libraries across Texas, read books on the Texas Bluebonnet Award List and voted for their favorite title. S.C. Lee’s school favorite ended up being Refugee, by Alan Gratz, but the overall winner for the state went to Sergeant Reckless: The True Story of the Little Horse Who Became a Hero by Patrica McCormick. Librarian Sandra Carswell made the announcement of the winning book by organizing a Texas Bluebonnet Party with refreshments, and special activities tied to various Bluebonnet nominees. Students enjoyed raft weaving to represent Refugee, card games to tie in with a scene from Sergeant Reckless, and created a beaded dragonfly to go along with the variety of plants and animals mentioned in Grand Canyon by Jason Chin. 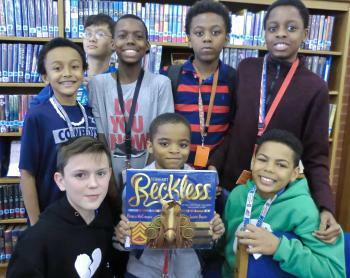 Sixth grader Tramir Ladipo could not believe Reckless won the prestigious Bluebonnet award.